Use these convenient Black Swirl Self Adhesive Necklace Fold-Overs for scarves, necklaces, hair ties, and a variety of other merchandise. Simply insert the item, fold over card, and seal. Hang on peg hooks, rack or counter stands. 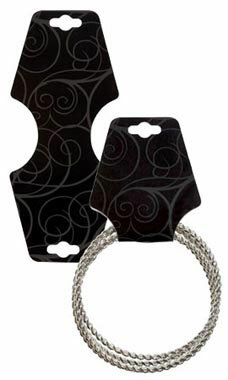 Use with coordinating Black Swirl Earring Cards (sku 55274) and Black Swirl Necklace Holders (sku 55275) to complete that professional polished look for your business.